Houseplants of any kind are a welcome sight in the winter. They add some life to the indoors and to the long, cold season. Indoor plants that flower are the very best way to bring some cheer to your home in winter. The big beautiful flowers of amaryllis bloom away in the middle of the coldest season, feeling like a little slice of springtime when you need it most—in the dead of winter. To grow amaryllis successfully indoors, follow these steps. It is absolutely worth it to have a showy display of gorgeous blooms greeting you on an otherwise dreary day. 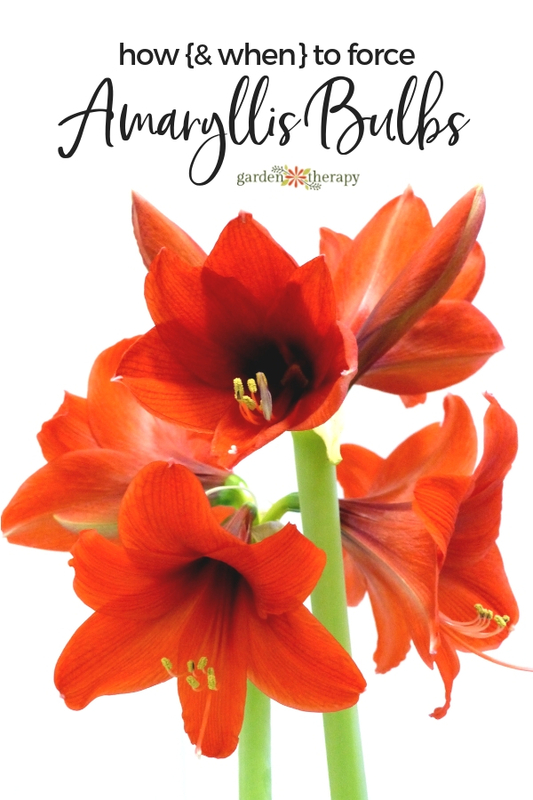 There are many different types of amaryllis in different colors, fragrances, and flower types (check out Amaryllis exotica, Ferrari red, and papilio butterfly). One bulb will grow two stems, which in turn will produce four flowers each. If you want really big flowers, choose the biggest bulbs you can find—with amaryllis, the size of the bulb is indicative of the size of blooms it will produce. If you need to store your bulbs before you plant them, keep them somewhere dark and cool (40-50 degrees Fahrenheit). A fridge is a great place to store them, just be sure not to keep them in there with apples because apples produce ethylene gasses which will sterilize the bulbs and prevent them from blooming. You can plant an amaryllis anytime between October and April, and it will bloom six to ten weeks later. 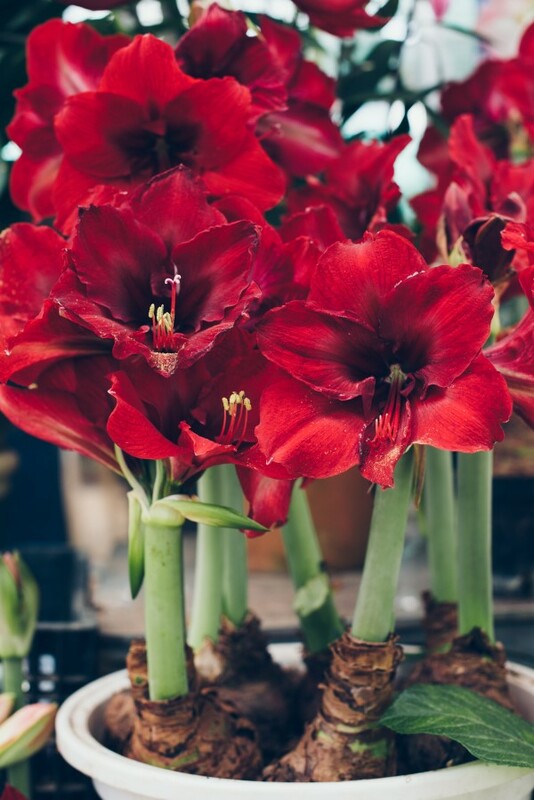 Consider this timing if you would like your amaryllis to bloom for a special occasion or holiday—if you count six to ten weeks back from your ideal blooming time, that is when you should plant. 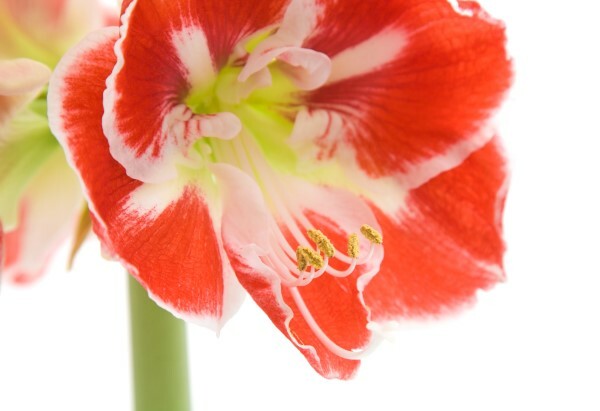 Six to ten weeks is the general range for all amaryllis, but individual varieties often have a more specific time period from planting to blooming. Check the instructions that come with the bulbs for this information. If you want to have lots of amaryllis blooming throughout the winter, simply plant every two weeks starting in October or later. Amaryllis work well in a variety of containers. The main thing that you have to remember when picking a container is that it must have enough weight to hold up a fairly heavy stem and large flowers without tipping over. I especially like to use glass vases and Mason jars, but have also been happy with decorative ceramic pots as amaryllis containers. Before you plant your bulb, soak it in lukewarm water for two to four hours. Using a compost-rich soil mix, plant the bulb into your chosen container, being careful not to damage any roots. Cover the bulb in soil up to its neck and pack the soil down gently. At first, only water when the top inch of the soil feels dry. Once a stem begins to grow you should start watering more frequently. Keep the amaryllis in a warm, bright spot with lots of direct sunlight. Sit back and watch it bloom! You can re-grow your amaryllis year after year. Remove old flowers from the plant as they fade and when the leaves of the amaryllis turn yellow, it is time to cut the whole plant down to about two inches tall and remove the entire plant—bulb and stem—from the potting mix. Gently clean off the bulb and store it until it is time to plant it again for next winter. Your article is good, read your article now I know how to plant this flower. I will do it day in my own house. May I have the most beautiful flowers. I have 2 bulbs and have kept them planted year round for the last 2 years. They regrow leaves but never a stem with a flower, will it ever re-bloom? Hi Demarie, have you been chilling them? 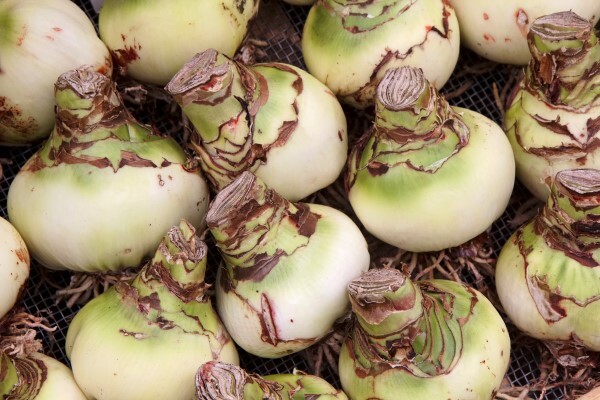 Most bulbs you buy for forcing have been chilled already, but if you are regrowing them at home, they need a cold period to stimulate blooming. How to propagate amaryllis and most importantly, what fertilizer you use after it blooms ?? I’ve been thinking about adding a plant to my decor but have been too nervous to do it. This post may have convinced me! What if the leaves are still green? Mine did not bloom last year but still has its green leaves. Should i cut it off? Stop watering? I think last year i left it on and stuck it in my cool dark closet. It did rebloom several years in a row before this. Hi Kristen, no, don’t cut the leaves. Some are evergreen and can keep the leaves. Keep going with bright light and watering and watch for a flower stalk. It’s harder to tell what timing it might bloom without a dormant period, but it very well could bloom at anytime.